What makes a person leader? How do our ordinary-looking habits exhibit leadership qualities? This article is for those who love to make rare choices about education, career, and life. The Sun doesn't need the approval of anybody to give life and energy to the whole world. If you are firm on living an upright life, then march ahead without any hesitation. Don't be apologetic for shining with your aura even if it isn't accepted by others. We are taught by the world to follow others and live in such a way so that we must get and feel accepted by everybody. Being a replica of the life of what is taught as ideal, is the only ideal life according to a generalized definition. The fear of rejection is implanted in our thoughts, since our childhood, by almost everybody we meet in our lives. Our decisions about righteousness depend on living in a safe comfort zone. We are trained to adjust all the time to fit in the comfort zone. We rarely meet true leaders. And, when we meet them, either we believe that they are the leaders, so they can do anything and we are bound to live in our favorite cage. Once you decide to be you with your own uniqueness, no matter what, just shine with it. Rejection is an opportunity that makes you a pioneer. Once you are rejected by everyone, you will be the leader of change as nobody else dared to think and execute the particular idea. Focus on the action when others are busy in criticizing you. The people who reject your ideas and vision, merely because they are unusual for them (or by ego battle), are ultimately going to accept and follow them; follow you. Even if they don't, your work isn't (and shouldn't be) dependent on others' reactions and opinions. Don't be hesitant to become a pioneer. Leadership doesn't need external machinery and exercise to prove its power to the world. Take rejection of ideas as the opportunity to be a pioneer. True leaders are not those who have fame or who have millions of fans. Leaders are those who know to lead without being apologetic, without bending their principles, goals and style of working to get accepted. The people with insecurities, even if we know and sometimes admire them as leaders, want their followers always under their control.They don't let the independent thinking among their followers grow. Those who love to induce and implant fears are the weakest people of the world. We have to experience controlling behavior from school, in colleges, politics, and by the society. Controlling behavior is thought as a necessary personality trait, so people try to maintain it to get a satisfaction of being a powerful leader. True leaders are those who create leaders. True leaders don't need to prove that they are the leaders. People may reject you, may offend you, may try to stop you, just believe in your own inner strength. Your inner light keeps guiding you. Every hardship makes you robust. Every act of criticism and rejection proves your power to the world without any effort carried out by you. Shouldn't you be thankful to them? They have been helping and inspiring you for so long. Stand for your goals and your uniqueness. Stand for your values; live for them. Let your work and your values be your friend, motivator, and promoter. Remember, no leader has grown to their full potential by living in a safe comfort zone. Leaders don't need a comfort zone. Leaders recognize potentials in everybody and unlock them. Let your work speak loudly. Just keep walking, no matter if you go slow or halt for a while. Just keep walking toward 'your' ambitions. 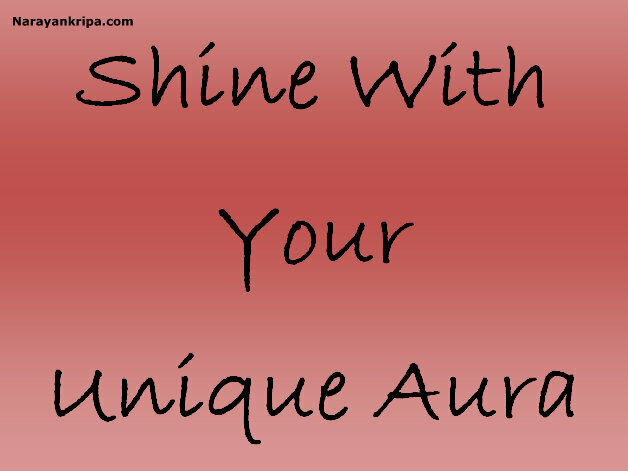 Shine with your unique aura for 'your own self'.